Rubus is a large and diverse genus of flowering plants in the rose family, Rosaceae, subfamily Rosoideae, with 250–700 species. Raspberries, blackberries, and dewberries are common, widely distributed members of the genus. 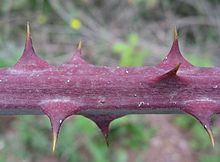 Most of these plants have woody stems with prickles like roses; spines, bristles, and gland-tipped hairs are also common in the genus. The Rubus fruit, sometimes called a bramble fruit, is an aggregate of drupelets. The term "cane fruit" (or "cane-fruit"), or "cane berry" (or "caneberry"), applies to any Rubus species or hybrid which is commonly grown with supports such as wires or canes, including raspberries, blackberries, and hybrids such as loganberry, boysenberry, marionberry and tayberry. Most species are hermaphrodites, Rubus chamaemorus being an exception. The blackberries, as well as various other Rubus species with mounding or rambling growth habits, are often called brambles. However, this name is not used for those like the raspberry that grow as upright canes, or for trailing or prostrate species, such as most dewberries, or various low-growing boreal, arctic, or alpine species. The generic name means blackberry in Latin and was derived from the word ruber, meaning "red". 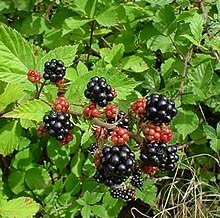 The scientific study of brambles is known as "batology". The British National Collection of Rubus is held by Barry Clark at Houghton, Hampshire. His collection stands at over 200 species and, although not within the scope of the National Collection, he also grows many cultivars. The term "hybrid berry" is often used collectively for those fruits in the genus Rubus which have been developed mainly in the USA and UK in the last 130 years. As Rubus species readily interbreed and are apomicts (able to set seed without fertilisation), the parentage of these plants is often highly complex, but is generally agreed to include cultivars of blackberries, (Rubus ursinus, R. fruticosus) and raspberries (R. idaeus). 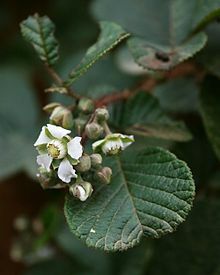 The genus Rubus is a very complex one, particularly the blackberry/dewberry subgenus (Rubus), with polyploidy, hybridization, and facultative apomixis apparently all frequently occurring, making species classification of the great variation in the subgenus one of the grand challenges of systematic botany. Rubus species have a basic chromosome number of seven. Polyploidy from the diploid (14 chromosomes) to the tetradecaploid (98 chromosomes) is exhibited. Molecular data have backed up classifications based on geography and chromosome number, but following morphological data, such as the structure of the leaves and stems, do not appear to produce a phylogenetic classification. The classification presented below recognizes 13 subgenera within Rubus, with the largest subgenus (Rubus) in turn divided into 12 sections. Representative examples are presented, but many more species are not mentioned here. Fossil seeds from the early Miocene of Rubus have been found in the Czech part of the Zittau Basin. Many fossil fruits of †Rubus laticostatus, †Rubus microspermus and †Rubus semirotundatus have been extracted from bore hole samples of the Middle Miocene fresh water deposits in Nowy Sacz Basin, West Carpathians, Poland. ^ a b "Rubus". Germplasm Resources Information Network (GRIN). Agricultural Research Service (ARS), United States Department of Agriculture (USDA). Retrieved 2010-06-27. ^ "Rubus L.". Tropicos. Missouri Botanical Garden. Retrieved 2010-06-27. ^ Alice, Lawrence A.; Goldman, Douglas H.; Macklin, James A.; Moore, Gerry (2014). "Rubus". In Flora of North America Editorial Committee (ed.). Flora of North America North of Mexico (FNA). 9. New York and Oxford – via eFloras.org, Missouri Botanical Garden, St. Louis, MO & Harvard University Herbaria, Cambridge, MA. ^ Brouillet, Luc (2014). "Rosaceae (subfam. Rosoideae) tribe Rubeae". In Flora of North America Editorial Committee (ed.). Flora of North America North of Mexico (FNA). 9. New York and Oxford – via eFloras.org, Missouri Botanical Garden, St. Louis, MO & Harvard University Herbaria, Cambridge, MA. ^ Klein, Carol (2009). Grow your own fruit. United Kingdom: Mitchell Beazley. p. 224. ISBN 978-1-84533-434-5. ^ Quattrocchi, Umberto (2000). CRC World Dictionary of Plant Names. IV R-Z. Taylor & Francis US. p. 2345. ISBN 978-0-8493-2678-3. 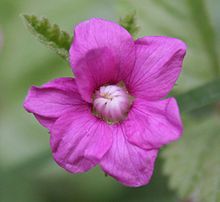 ^ "Plant Heritage – National Collections Scheme, UK Garden Plants". nccpg.com. Retrieved 20 January 2015. ^ Ardle, John (July 2013). "Hybris vigour". The Garden. ^ Lawrence A. Alice & Christopher S. Campbell (1999). "Phylogeny of Rubus (rosaceae) based on nuclear ribosomal DNA internal transcribed spacer region sequences". American Journal of Botany. Botanical Society of America. 86 (1): 81–97. doi:10.2307/2656957. JSTOR 2656957. PMID 21680348. 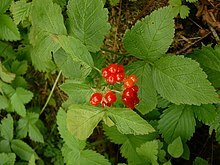 Wikimedia Commons has media related to Rubus.